June 2013 - C repaired the vinyl cutter, it's up and running again! Vinyl cutters take paper-backed vinyl and cut them robotically. They talk HPGL. HPGL can be generated from various vector tools. We have a 50" USCutter MH1351-MK2. Cut speed - this depends on the complexity of the cut. 10mm/sec for complicated cuts, up to 200mm/sec for big stuff. Cut Press - play around with this - 50g works well. When cutting the printer cuts 7% larger than the mm scale in inkscape, so for size-precise cuts, downscale by 7%. Cover the machine when done. Dust is bad. Flip the pinch roller levers up. Go adjust the configs, match up the baud rate at 2400 on both the software and on the cutter. 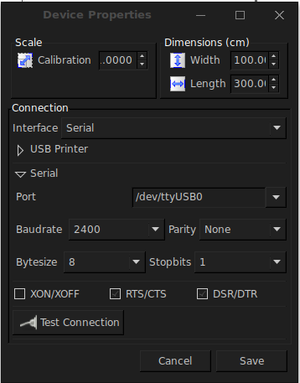 Make sure you turn on hardware flow control ("Hardware (DSR/DTR + RTS/CTS)") in the inkscape plot settings. Make sure that the Serial port is set to /dev/ttyUSB0. Go ahead and cut what you wanna cut. If you need to change the cutting order, make sure that BOTH the Layers AND the order of the different paths in your cut have the thing you want to cut first on the bottom (and in the bottom layer), and the thing you want to cut last on top (and on the top layer). See if the device is connected by running the command lsusb in Terminal. The name of the vinyl cutter is Prolific_Technology_Inc._USB-Serial_Controller. Make sure you connected the serial port on the vinyl cutter (the fatter plug) to the USB port of your computer. Make sure your Device Properties are right. The baud rate (2400), hardware flow control ("Hardware (DSR/DTR + RTS/CTS)") and serial port (/dev/ttyUSB0) need to be changed from default settings. 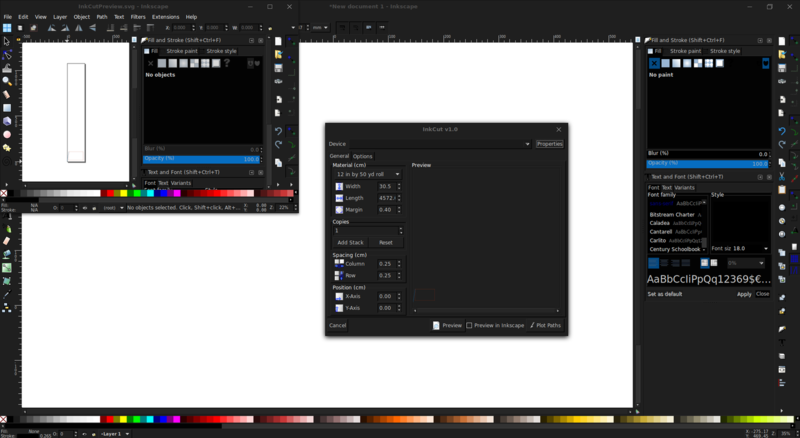 If you cannot click anything on Inkscape, the active window is probably under your current window. This happens, for example when you press Plot Paths - there is a second confirmation window that appears UNDER Inkcut window, and you have to move the Inkcut window to see it. If all the settings are fine and the vinyl cutter is plugged in correctly, and yet you cannot send cuts to it, try switching it to the wrong port in Device Properties, saving, and then switching it back to /dev/ttyUSB0 and saving. If the above is way too complicated and you are like Henner, just write your stuff directly in PostScript (or generate it otherwise), convert to HPGL and send it to the plotter in a one-liner without leaving the comfort of your shell. Make sure to set the plotter to 9600 baud before, the 2400 baud mentioned above in the InkScape setup seems to not work and run into buffer-troubles. The pstoedit command converts the PostScript file to HPGL, which is the command language typically used by pen plotters or vinyl cutters. We need to scale to 0.98425 because the cutter seems to have 1/1000" units instead of standard HPGL 1/40mm. The -dt option makes sure to trace letters (the cutter can't deal with text otherwise). Note, only text sufficiently large makes sense on the cutter. The socat command sends the HPGL output of the previous command to the serial interface. It is useful in itself if you already have a HPGL file and want to send it over. Note that the Sure Cuts a Lot software is no longer installed on the computer by the laser cutter, as of August 10, 2016. Vinyl cutter users generally use the Inkscape plugin. Set mode to "Origin", not "WYSIWYG". This is usually already set. It was suggested that Noisebridge should have a vinyl cutter, which can be purchased for ~$300. This page was last edited on 3 September 2018, at 04:15.